Hurricane Earl is at Norfolk's doorstep. Trees are waving in the wind, and the birds and squirrels who are usually up at dawn are being being all crazy, hiding away in the courtyard of our apartment building waiting for it to pass. Right now as I type this, I have a huge Siamese cat on my lap looking for comfort and another, much smaller cat under my chair. But the funny thing is that while there are folks out there filling their freezers with 15 loaves of bread and OBX is being evacuated, there's another group out and about without even an umbrella. The Shannons fall into the watching-the-G.I.Joe*-movie and playing-Xbox category. Obviously that means we should make a fancy French dinner to go along with our evening of high culture. I mean, what goes better with a movie that literally shows the Eiffel tower being eaten than some Vegan Bordelaise? I get asked a lot why we aren't veganizing Julia Child's Mastering the Art of French Cooking, since this project was inspired by the movie Julie and Julia. Especially since I freaking love French everything. The answer is simple. Dan and I asked ourselves what we wanted to do with this project - what were our goals and what would help the animals the most. It was pretty clear. We wanted to prove that you can make anything vegan. We wanted to show people how to use vegan products and share little tricks we have learned to maximize the potential of these products. The choice was pretty clear after that: Betty Crocker. We get to still make the fancy French stuff that made Julia swoon, but we also get to experiment with more American cuisine, like Cheeseburger pie. Betty is the undisputed champ at teaching America how to be creative with products and foods that you may never have thought were capable of such levels of awesome-ness. We just want to show vegans that they can do that too, and dispel the myth that we're stuck with veggie burgers or quinoa pilafs... not that those aren't pretty amazing sometimes too. We're just trying to show that going vegan doesn't mean sacrificing some of your favorite dishes... like, for example, a schmancy Bordelaise sauce. This dinner was so easy and so good, I've fallen in love with it. When we make this again (and we will) we're planning on a side of steamed asparagus or green beans to go with it... maybe some vegan fondue too. Both vegetables would be very good with the Bordelaise. That's not to say the Rosemary Potatoes didn't compliment this dish perfectly. If you haven't figured it out yet, I'm a sucker for a good rosemary dish. This may not seem like an obvious recipe to post for Labor Day Weekend, but with Earl making his way up the East Coast, many of us are going to be trapped inside playing Zombie games. This is a great Date Night dinner that you many already have the ingredients for already. Plus, what warms up a rainy night faster than a deep glass of red wine? Coat a glass dish with Cooking Spray. Put your Gardein in the dish, turning then chunks a few times to make sure they have a light coating. Bake the Gardein for no more than 10 minutes. You just want them cooked enough to be hot and have a light skin. Making the sauce only takes around 15 minutes, so if you plan it right you should be able to add the Gardein right from the oven into the sauce. If not, just turn off your oven and let them stay warm in there. In your bien-aimé cast iron skillet, melt your Margarine over a medium heat. 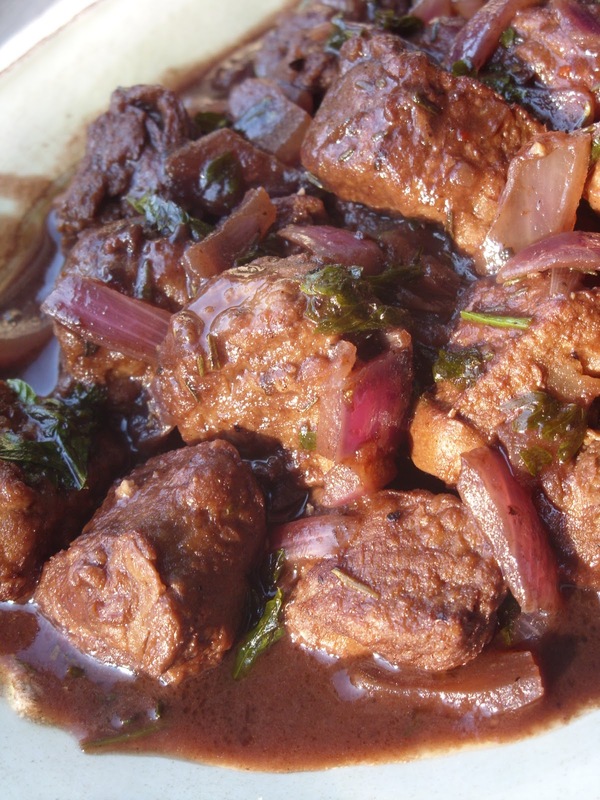 Cook Red Onion Slice in the melted Margarine, stirring constantly, until Red Onion is brown. Then remove the Red Onion. Stir Flour into the melted Margarine until smooth. Lower heat to a simmer and stir in Broth and Red Wine. Once smooth (you may need to use your whisk), stir in Thyme, Parsley, Chopped Onion and Bay Leaves. Then, heat to a boil while stirring constantly for one minute. While you're doing this, add Braggs, Olive Oil and Lemon Pepper. Then, mix in your hot Gardein. Make sure you heat up some French bread to serve with this. You need it to dip in your sauce or else you'll be stuck licking your plate to get it all. That kinda thing can ruin a Date Night... or make you closer... every relationship is different. 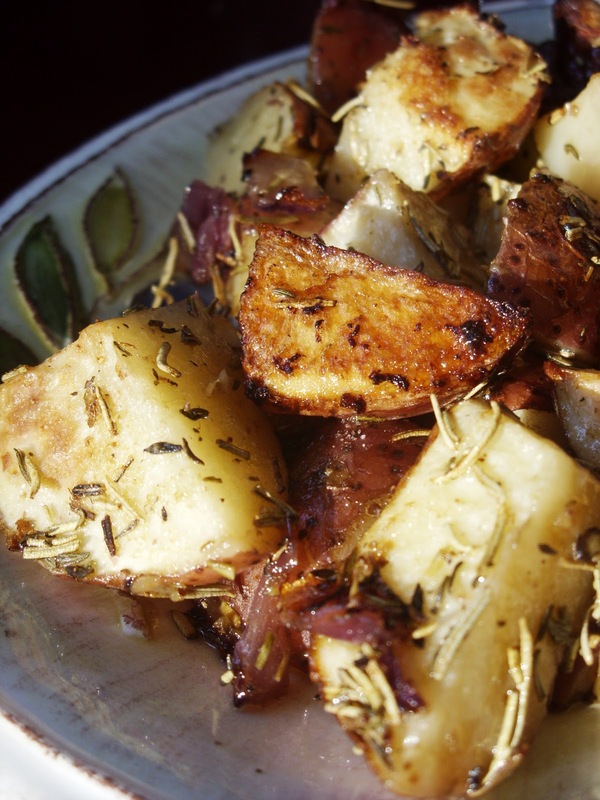 Your side of Roasted Rosemary Potatoes will take 25-30 minutes to make and 10-15 minutes to cool down, so I recommend making them first. Heat oven to 450. Spray a 15x10 glass baking dish with Cooking Spray. In a large bowl, mix all the ingredients, adding Potatoes last. Toss the Potatoes to coat. Spread the Potatoes and Herb Mix in a single even layer in the baking dish. Roast uncovered for 20 minutes. Then, pull out the dish, and flip the Potatoes with a metal spatula. Return to the oven to bake another 5-10 minutes; remove when they are golden brown and tender. IMPORTANT NOTE: The smaller you cut your cubes, the faster they bake, so please keep an eye on them. Yours might take less time to cook because they were cut smaller or your Potatoes weren't as large. *Talk about a heartbreak. Dan and I sometimes play this game where we cast movies based on our favorite cartoons and comics and we had an excellent G.I.Joe movie line-up. Kinda breathtaking really. Good news this one was so bad; it is kinda begging for a remix. Finger crossed. This looks so real, I almost wouldn't want to eat it. But, it's vegan so I'm good! :) I'm going to be trying this in the very near future. It was super good. Kinda wish I had some now.